With Orphan Black in its fifth and final season, and Peter Capaldi kicking off his last outing as the 12th Doctor, BBC America is in the market for its next hit TV series. Is this new Doctor Who spin-off the right prescription? The series reportedly drew disappointing ratings in the UK. 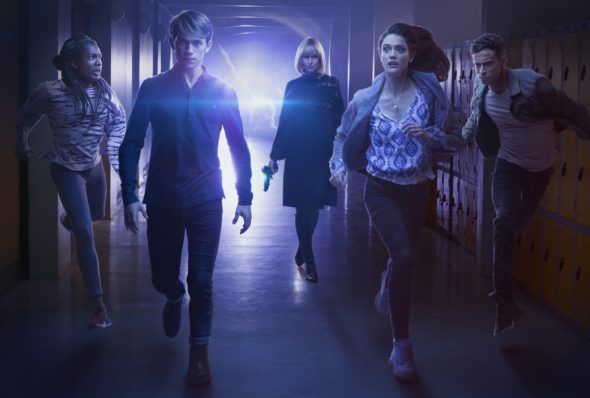 Will the Class TV show be cancelled or renewed for season two? Stay tuned. Airing on the BBC America cable channel, Class stars Greg Austin, Fady Elsayed, Sophie Hopkins, Vivian Oparah, Katherine Kelly, Jordan Renzo, Aaron Neil, Pooky Quesnel, Paul Marc Davis, Anna Shaffer, and Shannon Murray. The sci-fi drama follows four students at Coal Hill Academy. Despite their differing backgrounds, they must band together to wage a covert war against aliens who have traveled through space and time. Under the supervision of Physics teacher Miss Quill (Kelly), Charlie (Austin), April (Hopkins), Ram (Elsayed) and Tanya (Oparah) must rise to the charge to protect Coal Hill, presented to them by the mysterious alien known as The Doctor (Capaldi). Below are the show’s TV ratings, typically the best way to tell if the series will be cancelled or renewed. In this case, the show’s UK ratings may have a greater impact on the series’ future. These figures will be updated as the weeks progress. Cable ratings are typically released within a day or so of the show’s airing, except for in the case of weekends and holidays. They are sometimes harder to come by, so there may be occasional delays or gaps. What do you think? How do you like the Class TV series? Do you think it should be cancelled or renewed for a second season? 9/11 update: The Class TV show is cancelled on BBC America, BBC 3, and BB1. Details here. I just started watching this in my GCSE class and everyone loves it so please don’t cancel it people will not be happy. And please don’t do what other shows do and cancel, because there is other people in the world. Yes there should be a second season! It can’t be left with the Angels winning. I really enjoyed watching Class. The feeling of dread and horror at the news of the Weeping Angels coming to earth sent shivers down my spine, just imagine a Dr Who / Class reunion to fight the Angels. You would need to bring back unit and Torchwood as well to counter this great invasion. This is one of the greatest spin-offs ever. PLEASE renew it for a season 2!! My daughter and I really enjoyed Class. Dr. Who, Torchword, Broadchurch,Class all wonderful to look forward to. I hope that Class will be back really soon. How did Quill become pregnant anyway? What will happen next? What about April? I’m Sorry but are you serious?? I meant have you really watched all episodes or are you just a troll? No offence intended but I’m willing to help you in getting the answer once you prove that you can respond back maturely and happened to just miss the plot. I loved it!!!! I really hope they continue with it!! !